Tucson is a special place. I may be a little biased since it’s quite possibly my favorite place in the world, and also happens to be the place I call “home.” It has majestic mountains, the bluest skies, and this combination makes for a constant real-life painting backdrop. There are bike paths on every road, snow an hour away in the winter, and Tucson lacks the more sweaty quality of my new place of residence (humidity). 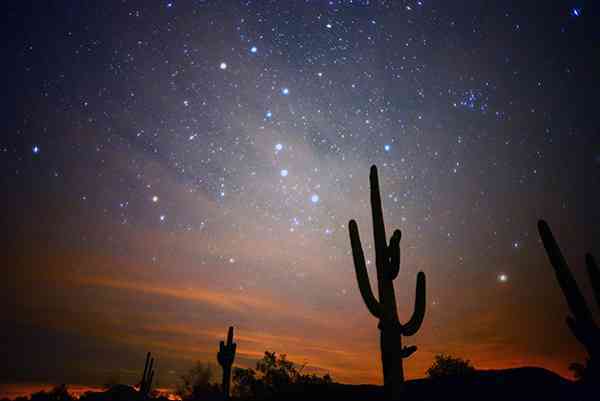 But beyond all of this, Tucson has consciously made a decision to prevent light pollution of our skies. The University has an impressive astronomy program and from the surrounding mountains, telescopes reach to discover all sorts of new things about the world beyond the clouds. You can be in the middle of town and still look up and see a hundred stars. Granted, it comes with its cons- many people don’t like driving on roads without street lights. Gait enters though, all it takes is one solid minute of staring up into that night sky to decide it’s all worth it. What is it about the stars that can completely distract your mind from all the other clutter? I see the stars like many people see the ocean, only I didn’t grow up near any water. But it doesn’t matter, because you can gaze up into those stars and see the same depth to the world and feel that sense of how minuscule your single body is in the vast planet. Ocean or stars? For me, I prefer the stars, for they can take us even beyond the ocean. Step outside and take a gander – it’s out of this world.